We’ve alot to to. 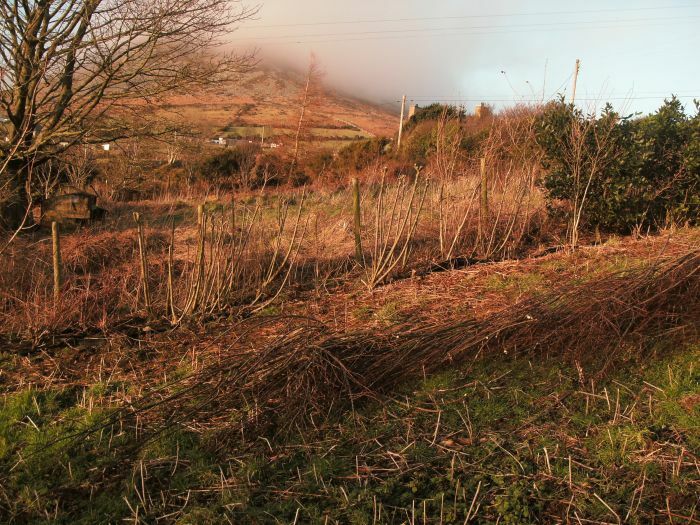 We have about 100m (330′) of double rowed willow of various types along with ten fruit trees and a dozen hawthorns which have to be pruned. 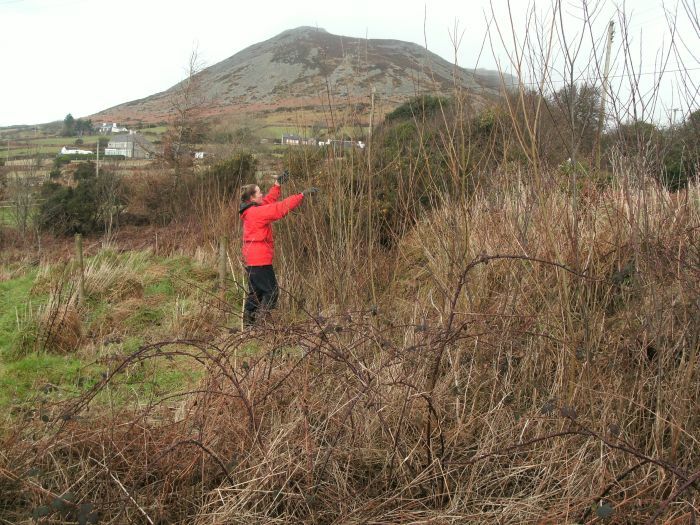 In addtion we’ve loads of gorse and other hedgerow species that need to be maintained at some stage. 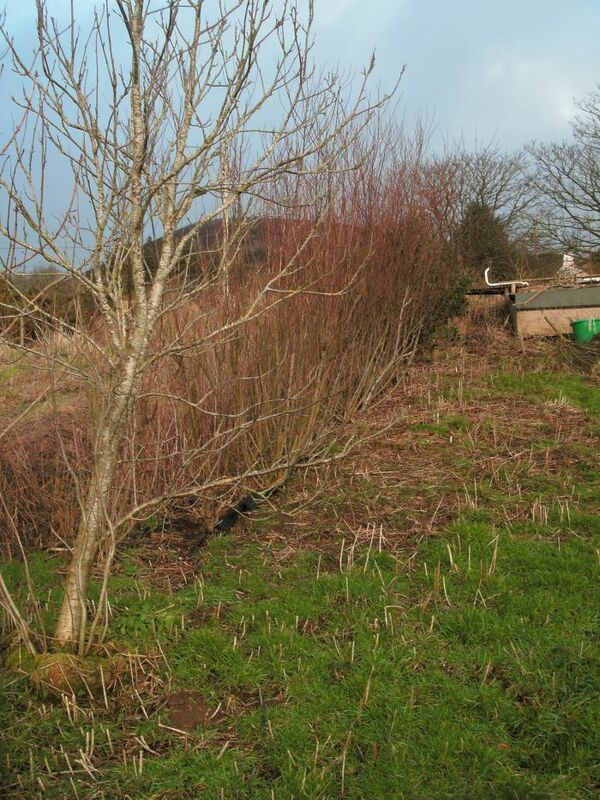 The first willow to ‘do’ was 2 year old mixed rods which had not had their first prune. These are planted along a hedge/road boundary as shelter and habitat. In the background our ‘mountain’ which we walk up for our morning constitutional. They were cut at about head height so that they sprout from this and thicken above the line of the stone wall behind. Essentially we’re creating pollards from scratch. 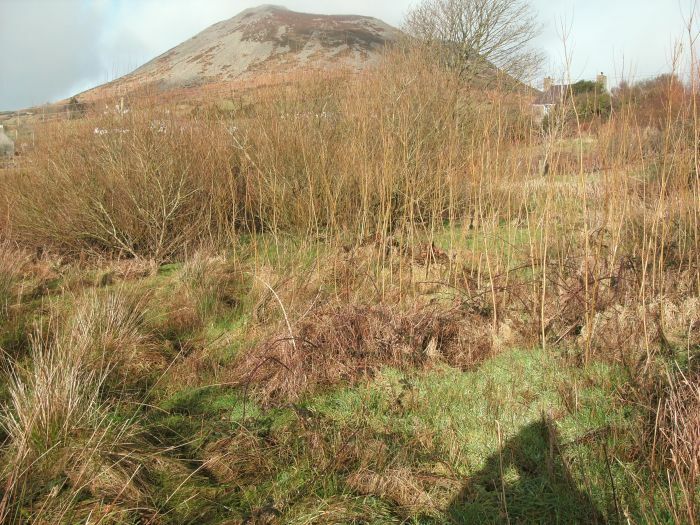 Next we wanted to do some much older willow, ‘viminalis’ (Osier Willow) which is much older (about 7 years) and had not got much attention for a few years. At its tallest, it’s grown to about 3m. As it’s quite old, most of it would not be good for weavin. It’s also in quite an exposed position and so shows wind damage. In the foreground is a Rowan (Sorbus Aucuparia), also known as Mountain Ash. We acquired this for free when we first moved in and so this tree is now 12 years from a whip which was about 30cm (12′) tall. It’s well established and is beautiful. Also interplanted is Red Dogwood (Cornus), Hazel (Corylus Avellana) and Bay (Laurus Nobilis). The bay certainly has thrived with some of the wind protection provided by the willow, the hazel less so. The dogwood was in recovery after having been harvested for our ‘Christmas Tree’ for a few years on the trot (but not 2009). I planted tall rods deliberately. I pushed the rods as far as they would go into the undergrowth and soil. We wanted the willows’ ‘heads’ to be well above the underlying vegetation. This was so that, when in leaf, they’d have relatively less competition than if we planted short rods. Given the site and money contstraints we couldn’t give the rods any further protection such as a mulch, they’d have to do the best they could. 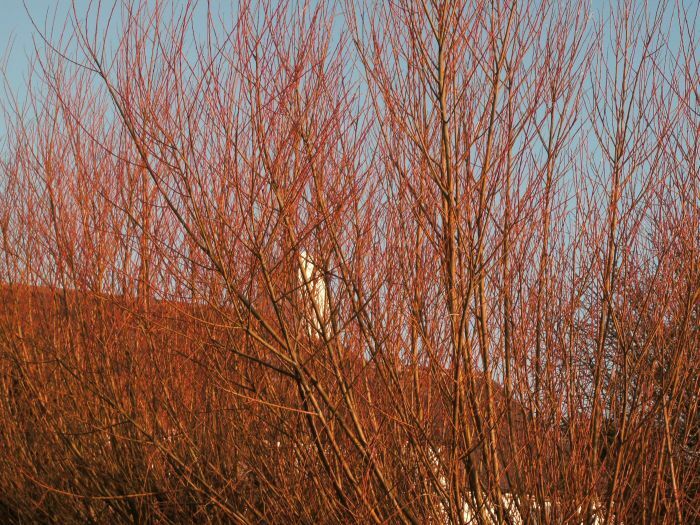 The willow you can see behind is Goat Willow (Salix Caprea). This had been planted from cuttings about 12 years ago to act as wind shelter for a duck house and pond behind (now defunct). 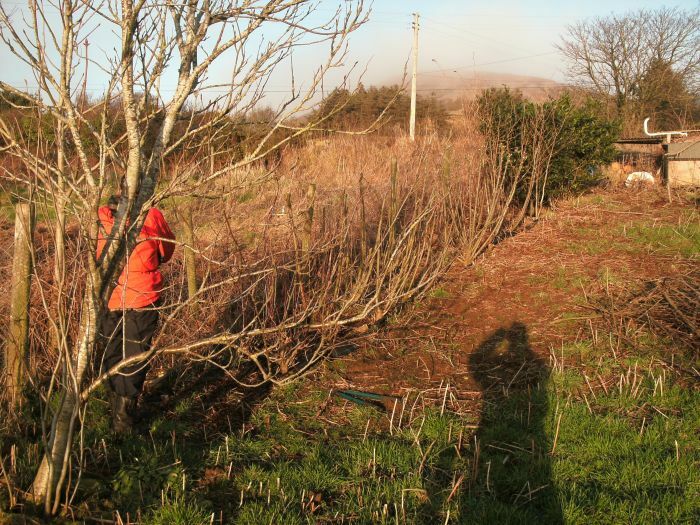 So we’ve planted a bit of what we pruned – much more to do. Anything we don’t use like this, or for making willow structures/sculptures we’ll put through a shredder and use as a mulch. Great post! Oh I wish I could get my hands on your spare willow whips!! !